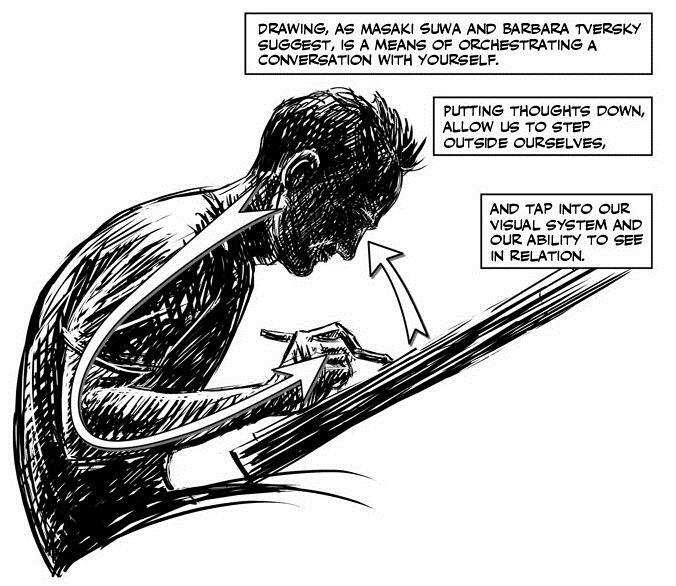 For this post, we sat down with Nick Sousanis to talk about the challenges and benefits of making a stronger connection between comics, scholarship, and pedagogy in higher education. 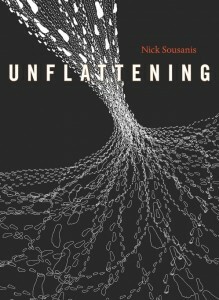 Nick defended his comic dissertation last spring at Columbia’s Teachers College and the published book, Unflattening, is being published by Harvard University Press this month. TC: You defended the first ever dissertation in comic form last spring and you are about to publish Unflattening with Harvard University Press, which we believe is the first scholarly comic. You could have written about comics, and interspersed the odd graphic piece to illustrate your arguments. Instead you chose an extended comic format. Why? NS: First off, I came into the doctoral program as a comics maker intending to do my work in comics form. This wasn’t a decision I arrived upon when I got there. Comics were and had long been a way I liked working and spoke to my strengths in how I organize my thinking. The work I was doing shortly before entering the doctoral program demonstrated the educational potential of comics. I knew that I could make work that handled complex subject matter while remaining accessible without dumbing it down. There were plenty of forerunners of smart work in comics including McCloud’s Understanding Comics, Spiegelman’s Maus, and Bechdel’s Fun Home (just to name three of the most prominent figures), so I assumed that that argument had already been won. Because of the widespread acceptance of such works, it didn’t seem like a big deal to me. That said, while my advisors were quite supportive all along, I did become aware that the environment I was in was not quite as open to such things as I’d perhaps naively presumed. Thus, at some point, while I hadn’t initially considered writing about comics—only making them—I realized that it was essential to make the argument for comics as legitimate scholarly work within my work, as part of a larger metaphorical argument about expanding the ways we approach scholarship and learning. I’m not sure about the first-ness of it—I know for sure there have been some partial comics dissertations prior, and I’m sure more will turn up. Most importantly, I hope this won’t be the last one! What I can say for sure is that it was of great importance to me to not simply argue for comics in text and to not do a halfway project. If one believes, as I do strongly, that comics are as legitimate a form of scholarship as textual works, then tacking on an explanatory text piece in order to justify it is really saying exactly the opposite—it can’t stand on its own, and it needs this. That would diminish the point of what I was up to, and I couldn’t do that. TC: What do you call this project? Scholarship? Art? Comics? I think a key to my process, which has subsequently become an underlying argument for incorporating other methods into scholarship, is that my aesthetic decisions and scholarly concerns fuel one another. That is, pages/pieces typically start with an idea that I want to explore. From there, a conversation between my sketches and research starts to grow—which then prompts more design sketches—and those in turn often ask for more research. This back and forth frequently takes the work in directions I wouldn’t have anticipated and it becomes a really exciting journey of discovery for me. Sometimes I find myself almost looking at the work as if viewing it from outside myself, and wondering, “How did that happen? !” Working solely in text or writing a script and then providing illustrations would have been an entirely different project. Certainly with some similarities—as both would be defined by the things that interest me to research and pursue—but otherwise I think they would have split at some early juncture and ended up worlds apart. TC: Many would be surprised to think that comics are about more than simply making something accessible. You argue otherwise—suggesting that comics offer us a new way of understanding that helps us access things we can’t in a strictly textual or strictly visual form. What is it about the combination of text and images that can offer us this new understanding? NS: Text and image do different things. They handle information in distinct ways. When they’re woven together, in the unique way that comics make possible, one is able to fill in the gaps that the other doesn’t address, and they speak to one another—text informs image, image adds meaning to text—a kind of resonance that keeps cycling back and forth. That said, text-image interactions aren’t the only thing that comics do (and some, most prominently McCloud, don’t include text as a defining aspect of comics). I think the most fascinating thing about comics is the way they can do multiple things at once. They present the sequential—panel to panel, image to image, word to word, as well as the simultaneous—the whole page as a visual composition. I think having these two reading modes or perhaps two types of awareness bound in a single form mirrors how our thinking transpires. We can focus, follow a single thought, but still have that overall awareness of our surroundings, be present to the tangential. Comics—as someone like Chris Ware explores so well—let us tackle the nonlinear, the recesses of memory that come in fragments not ordered like clicking through to the next slide. Comics let us layer ideas on top of one another and allow for an array of multimodal elements like color, font, and line quality to come through all at once. Having access to all of these resources as a maker opens up the way we can convey narratives and ideas. And I think they are a way to hit the reader on many levels but in such a subtle way. Because it’s coming through our visual system, which is constantly processing immense amounts of information below our conscious awareness, it seems simple. But the simple is not so simple. And I confess to having a less-than-fuzzy feeling for the genre of comics aimed at providing easy access to the real thing. It’s not that there’s anything wrong with that per se, it’s just that as you said in the question, that’s all that people end up seeing comics as being capable of—a gateway to something higher. Comics are far more than simply “___ for dummies.” For me, I want to make comics that tackle complex and difficult subject matter and use the visual in ways to help readers realize that this is subject matter they can grasp—and it was only the vocabulary that had provided the obstacle to their understanding. TC: We’ve heard people say that comics are fine as fiction or even as non-fiction, but scholarship requires rigour. Is it possible to approach the production of comics with rigour? What does “rigour” mean in the context of comics? NS: Goodness—has anyone saying such a thing ever made a comic before?! Talk about “rigor”! (And apologies, despite living in Canada for four months now, I’m still struggling to insert that “u” there….) Comics are a rigorous, exacting, demanding activity. And for that matter, had I done my work only in text, I would’ve finished a year or two earlier. But the real point here is that sure, we’ve seen comics used for fiction and non-fiction narrative purposes, and so that’s what we’re accustomed to. And that goes for comics makers themselves too. 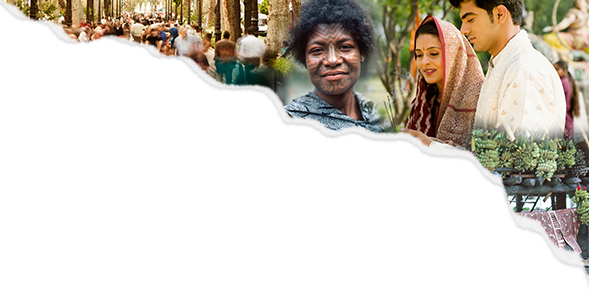 However, scholarly inquiry, as I understand it, is about the questions we choose to explore, the methods with which we approach these explorations, and the resources we bring to bear upon our studies. A text-only scholarly work no more guarantees a rigorous approach than a comics-based approach would not. As in the question above, how can we use the visual to do things we can’t do in words? And I think even if you’re someone who is opposed to comics as research—you’d admit that there are certainly ways in which images convey ideas that text doesn’t. So if we accept that, ultimately I think it’s most important to find the form that best suits the content and the scholar/artist/inquirer doing the work. This means that in whatever the form, we can focus solely on the quality (or rigor if that’s the preferred term) of the work—that is the author’s command of the argument and command of form, which in my view become inseparable. And of course, as it is currently, command of argument and writing already go hand in hand because that’s the form we’re familiar with in framing arguments. 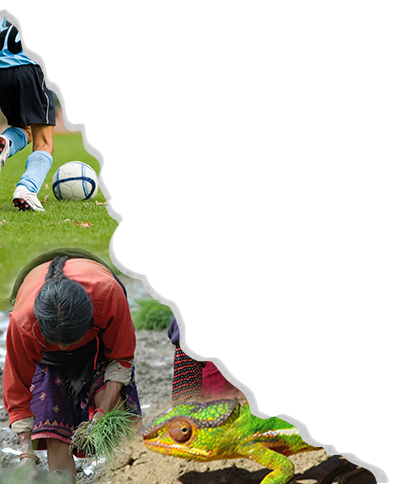 TC: What do you think of the idea of ethnography in graphic format? And how do you think it could happen? Do ethnographers need to draw for instance? TC: Do you think anyone can learn to draw effectively or do you think an ethnoGRAPHIC novel would require an ethnographer to collaborate with an experienced artist who knows how to think visually? NS: Yes, I do think anyone can learn to draw effectively—but I think we need to expand the definition of what drawing means. So much about comics is the way in which we orchestrate the reader’s movement through the space of the page and that is not contingent on a particular type of drawing style. Organizing marks, shapes, color to convey meaning lies at the heart of what drawing is—and I think exploring ways to represent ideas by drawing on more abstract principles and not feeling attached to a particular expected style. And then even the range within the representational styles in comics is vast. This makes me think of Ann Marie Fleming’s graphic novel The Magical Life of Long Tack Sam, which accompanied her film of the same name and subject—a memoir about her grandfather. Fleming offers up front her lack of drawing skills, and then proceeds using slightly more developed than stick figure drawings, photographs, maps, and more to tell an engrossing narrative. It works. 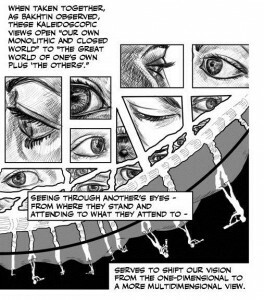 And I think exploring what’s been done in comics and outside of comics proper offers hints to ethnographers looking to find their own way to do the work. Working with a polished professional offers a different result, but I think even in that case, it’s really important that the researcher be versed in the medium they want to present in—even if they don’t do the final images. TC: Can you think of some collaborations (Harvey Pekar??) in comics that have or haven’t worked particularly well? Anything we might draw from that? NS: Speaking of Pekar and ethnography, Harvey adapted Studs Terkel’s Working in comics form with a team of artists. I think Alan Moore and his collaborators over the years certainly set a high bar for the possibilities for collaboration. In Moore’s case, he started out as a comics artist, but soon turned to focusing solely on writing. But, it is immediately evident from reading his scripts, how precisely he’s thought out every inch of the visual organization of the page. Yet at the same time, you get the sense that artists are free to take it in different directions, and in many of his works, the books are developed between the writer and artist working hand in hand, and the stories are crafted to speak to the strengths of the person drawing it. I think you can certainly find examples where a writer pulls off amazing things with a certain artist and perhaps less striking with others. That’s not necessarily a sign of a weaker artist, but something about that collaboration didn’t gel. In the mainstream arena, Grant Morrison’s collaborations with Frank Quitely spring to mind as both of them achieving something artistically perhaps higher than they do when working apart. That’s subjective on my part. Perhaps there’s an ethnography to be done on collaborations in comics…. TC: Ha! Now there’s a meta-challenge for interested anthropologists. Thanks so much for taking time out of your busy schedule to talk with us. We’re anxiously awaiting the formal release of Unflattening. Here’s your chance to shamelessly promote the project. When is it being released and what is the best way to get our hands on it? NS: Thank you! Excited to see what develops on the comics-ethnography front. As for getting Unflattening, it’s out now! You can find it from the usual online sources, major bookstores, and some comics shops, and you can always ask your local bookstore or comics shop to order it! Check Harvard University Press’s site for more info, and my site (www.spinweaveandcut.com) for excerpts and more on comics and education.